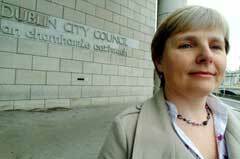 There were furious exchanges in Dublin City Council last Tuesday Evening as Sinn Féin's newest Councillor was co-opted. Sinn Féin Council Group Leader Christy Burke proposed the co-option of Criona Ní Dhálaigh to take the Sinn Féin seat for the South West Inner City, left vacant by the resignation of Andrew O'Connell. During the co-option process Labour Party Councillor Eric Byrne questioned the reasons given by O'Connell for his resignation, which were family and personal commitments and attempted to suggest that Sinn Féin had forced him out of the seat. Byrne also attempted to link a recent spat between O'Connell and the Lord Mayor to his resignation. Infuriated by this blatant and opportunistic attempt to score political points at the expense of an outgoing councillor Christy Burke cut Byrne short saying: "I never heard such rubbish. I expect nothing from a pig but a grunt" Byrne's remarks were also criticised by the Lord Mayor. Accepting her co option, which was seconded by Crumlin Councillor Robert Sargent and agreed unanimously, Criona Ní Dhálaigh said. "There are huge opportunities in the South West Inner City and I and Sinn Féin want to play our part in working with local communities to ensure they benefit to the fullest from these opportunities and investments"
She thanked Andrew O'Connell and wished him and his family the very best, Councillor Christy Burke for his support and encouragment, and the Lord Mayor and Dublin City Council officials.